Wouldn't it be great if we could just pick up a pencil and start drawing from memory? To put something straight from my mind onto paper is something that has been on my wish list for a long time. 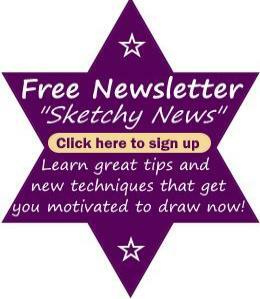 I receive numerous emails asking how to do it so it seems we all aspire towards the same goal. Stay with me because it so happens there is a very easy solution to this dilemma. 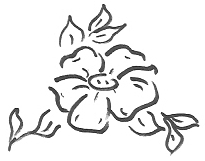 Let's start with a simple outline of a flower. It can be anything you like but, for this to work, it must be simple and it must appeal to you. Here is my simple memory drawing that I want to call upon anytime. 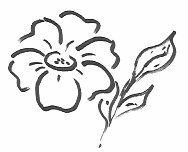 This isn't an original image, I recall seeing a similar flower drawing in one of my art books and I took an instant liking to the simple design and its effect. Find the picture or object that you wish to be drawing from memory and place it before you. Prepare your art paper and pencils. Study your reference picture or object. Copy the outline by constantly refering to the original. Draw it several times until you feel familiar with it. Hide or cover the original plus any practice pages. Draw the outlines from memory. Compare your memory drawing with the original. Do another copy using the original reference picture. Cover it over again and do another drawing from memory. Repeat the process from Step 5. It doesn't matter if your drawing isn't any good when you compare it to the original (Step 6), because by completing this practice, you learn more and remember more each time. This is a terrific exercise because it enables drawing from memory in such an easy fashion. It's important to constantly refer to your original reference picture or object because it is the source of the mental image that you reproduce. If you don't refer back to the original, then the source of growth is cut off and you end up using the same old (incorrect) image over and over again. Remember that you only need to practice memorizing the outline. When you want more flowers, you simply continue the pattern across your page, adjusting the position and size, here and there. The drawing above was done in ballpoint pen, using carefree strokes and no thought process. It's not perfect but it does the job for me! The outline is your base. What you create from that is up to your endless imagination. By starting with an outline, you are eliminating all the distracting details. It's just impossible to draw all that you see. Study an object to get ideas of form and then choose to draw whatever you like about that object. You have the power and the right to omit anything that you don't want to appear in your drawing. As you progress with learning to draw, you subtly acquire the skill of reducing forms to outlines. It is hard to remember everything there is to know about drawing. However, the only thing you have to pay attention to is what you want to accomplish. Answer your own needs and focus on learning those parts thoroughly. 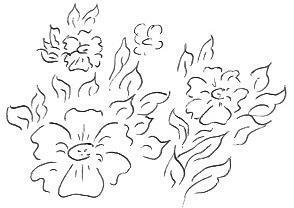 Once you can draw the flowers to your satisfaction, pick another simple subject that appeals to you. If you love animals, experiment with a way that you can express an animal with just a few lines. If you need some further examples, see these drawing templates or visit the sitemap and click your favorite topic for more examples of outlines. As an art student taking classes, you are frequently required to produce something from memory. It shows the teacher how much you have retained and at the same time it is a valuable means for developing power of memory. You begin to reproduce forms without referencing a copy and all within a specified time. This is an age-old process that we use to learn. I hope you have a go at this exercise for assisting drawing from memory. If you don't like the results, then don't show anyone! It doesn't matter even if you think it was a failure because ultimately you will improve your drawing skills. Memory exercises keep your brain active and that's a good thing for all of us.